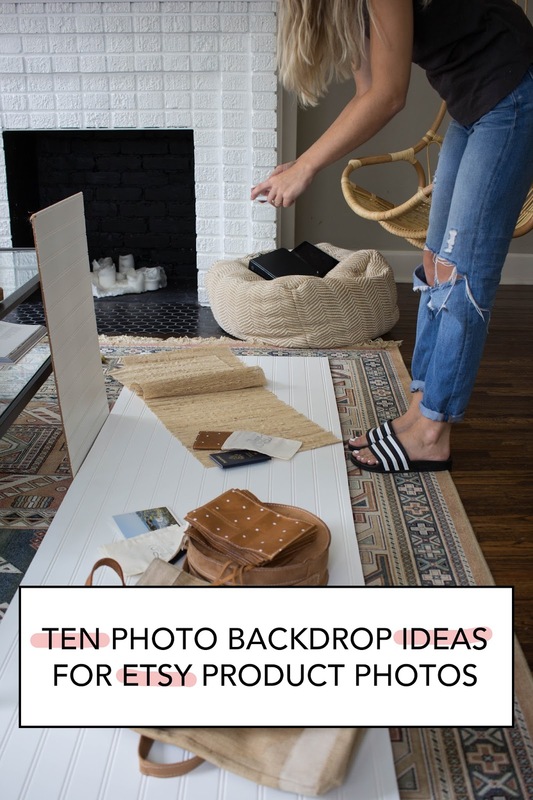 always rooney: 10 Photo Backdrop Ideas For Etsy Product Photos + A Free Listing Photo Checklist! 10 Photo Backdrop Ideas For Etsy Product Photos + A Free Listing Photo Checklist! It can be difficult to think of new ways to photograph your products to sell on Etsy. General rule of thumb is to keep it simple, light, and in line with your brand. Make sure you don't go for anything distracting. With that said, if your brand is more moody, embrace it and use dark backgrounds! I just like to use backdrops to add texture, not to compete with the product. I also recommend shooting your product on a plain backdrop and feature at least 2 photos with a plain background that can easily be used for editorial pieces. Here are 10 photo backdrop ideas for etsy product photos, most are less than $5 each. 1. $.99 posterboard- comes in an array of colors (steer clear from anything too bright) and you can find it everywhere. I recommend white, black, light gray or navy blue. 2. Beadboard- My new photos for Etsy feature a beaadboard backdrop leftover from a home project. I like how clean it looks! 3. Paint Stirrers- completely free at your local home improvement store! I painted about 10 paint stirrers white and lined them up to mimic a thin shiplap for photos. Works like a charm! 4. Tile- Similar to this DIY, using tile as a backdrop is a great texture to add. I can imagine jewelry or a beautiful watch being shot on this background. 5. Table Runners- Natural runners like this one are inexpensive and versatile for your product photos! 7. Wood planks- Go out to your garage and find some leftover wood and get creative! 8. Printed Cardstock- have you ever perused the scrapbook section of craft stores? They are full of amazing products that don't just work for scrapbooking. Take a look at their printed cardstock but remember: keep it simple. 9. Textured Linen Fabric- I love the juxtaposition of a soft, delicate linen fabric with a more structured or heavier product. 10. Marble Contact Paper- You don't have to spring for an expensive marble slab, the paper will do the trick! Now that you have your creative juices flowing for backdrop ideas, don't forget you also need to take the right photos for your listings. 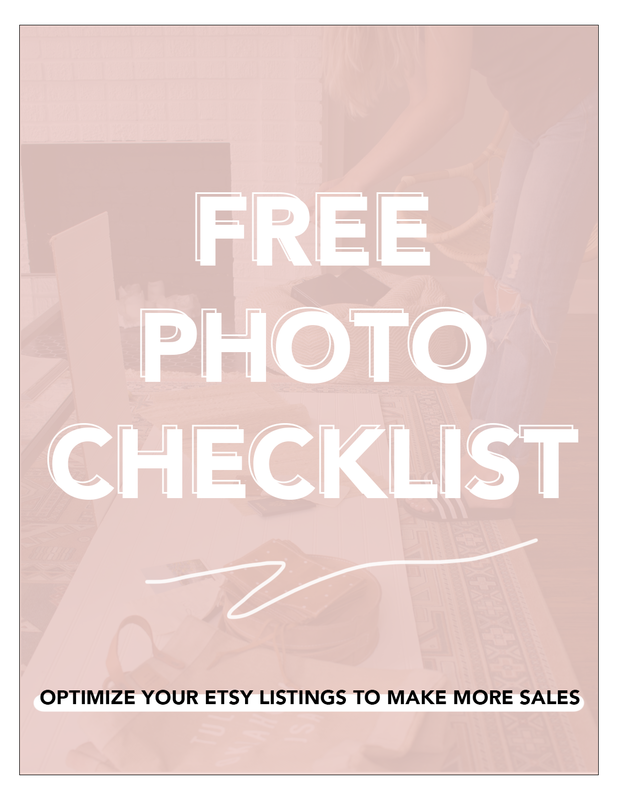 Grab my Free Photo Checklist to make sure you're providing the perfect photos for your customers! Click the photo below and sign up for my Etsy Tips Newsletter for the Photo checklist!